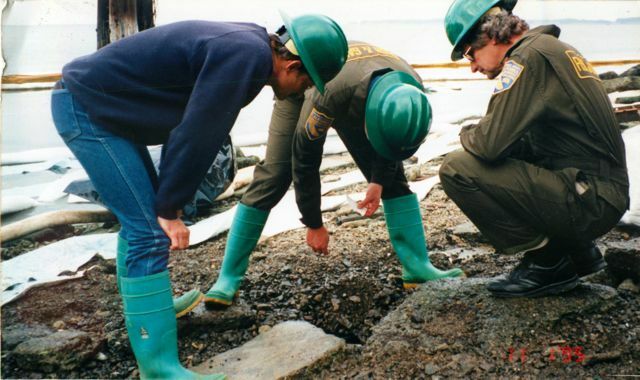 Left: CA Department of Fish & Game, Office of Spill Prevention & Response, during supervised field trial of the CytoSol Process at a gravel shoreline fuel oil spill along SF Bay in 1996. Right: CytoSol treated fuel oil flowing through the sediments with a passive ambient temperature water deluge. 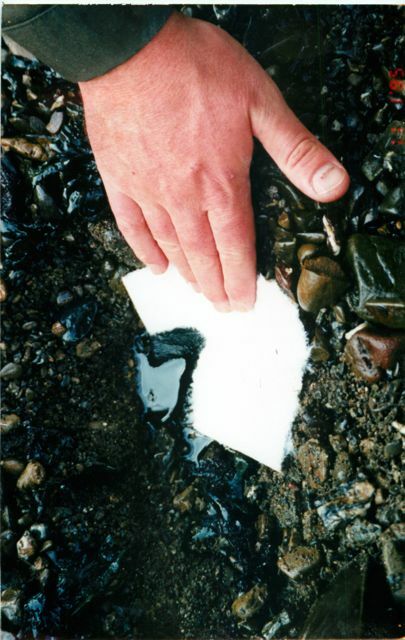 Oil migrating to the bay for collection is readily wicked up by absorbent pads as shown here. * CytoSol consists of straight-chained aliphatic esters that boost populations of naturally occurring hydrocarbon-degrading bacteria at spill sites. In combination with oliophillic nutrients in the formulation and synergistic bioremediation technologies, the CytoSol accelerates the biodegradation of residual petroleum and ester hydrocarbons left on the shorelines or in water. * CytoSol Biosolvent is already staged for deployment from our warehouse in New Orleans to service ports such as Port Fuorchon, Venice, and Dauphin Island, AL and Pensacola, FL. 5,000 gallons of product are available immediately in bulk and intermediate containers, including 275-gallon HDPE totes ready to load on trucks and response vessels. Another 100,000 gallons of formulated product is available regionally as required. **This listing does NOT mean that the EPA approves, recommends, licenses, certifies, or authorizes the use of CytoSol biosolvent on an oil discharge. This listing means only that the data have been submitted to EPA as required by subpart J of the National Contingency Plan, 300.915 (Source 40 CFR section 300.920 (e)). The CytoSol shoreline cleaning process was developed and tested in California in 1994 to facilitate the recovery of spilled heavy petroleum from oiled shorelines in ecologically sensitive marine and aquatic habitats. The process uses a proprietary “Biosolvent” formulated with methyl esters of soybean, vegetable oils and animal fats, along with nutrients to enhance the biodegradation of residual hydrocarbons. The methyl esters have a strong solvent activity capable of dissolving weathered crude oil and fuel oil from various shoreline habitats including marshes, tide pools, and marine sediments. Unlike other shoreline cleaners, the CytoSol is non-toxic and non-volatile, and contains no surfactants. In practice, the CytoSol is applied directly to oiled shorelines, vegetation or structures and then the dissolved oil/CytoSol mixture is rinsed off with a low-pressure water spray. Extraction efficiencies in field trials from approximately 50% to over 90% for the removal of weathered fuel oil and crude oil from different shoreline substrates. Since the CytoSol has a relatively low specific gravity (0.87), the product acts to “lift and float” the dissolved oil onto the water surface for easier recovery with conventional skimmer and boom technologies. Recovered oil/CytoSol mixtures can be recycled as burner fuel for oil fired ships and power plants. The presentation will include marine toxicity studies and field trials involving the cleaning of crude oil from oiled mussel beds, oiled marsh plants, an oiled creek bed and an oiled shoreline along the San Francisco Bay. In 1999, a mesocosm simulation of a fuel oil spill cleanup was conducted at the Shoreline Environmental Research Facility (SERF) by Texas A&M University in Corpus Christi. The mesocosm evaluated the CytoSol and another more conventional shoreline cleaner. Gas chromatography was used to quantify the oil remaining on the beach after treatment with the respective cleaners, as well as oil recovered by skimming and oil partitioned into the water at various distances away from the active surf line in each tank. In 1997, CytoSol was listed on the NCP Schedule of Products and licensed by California as a shoreline cleaner for oil spill cleanups.